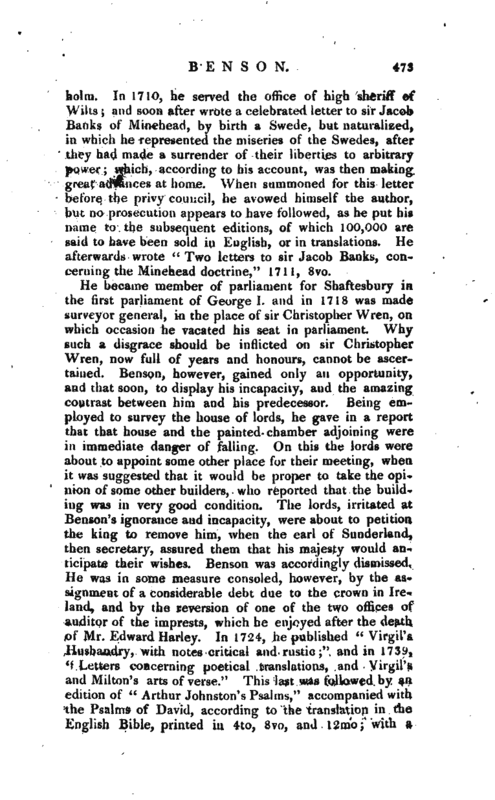 , an English critic, once of some fame, the son of sir William Benson, formerly sheriff of London, was born in 1682. After receiving a liberal education, he made a tour on the continent, during which he visited Hanover and some other German courts, and | Stockholm. In 1710, he served the office of high sheriff of Wilts; and soon after wrote a celebrated letter to sir Jacob Banks of Mihehead, by birth a Swede, but naturalized, in which he represented the miseries of the Swedes, after they had made a surrender of their liberties to arbitrary power; which, according to his account, was then making great advances at home. When summoned for this letter before the privy council, he avowed himself the author, but no prosecution appears to have followed, as he put his name to the subsequent editions, of which 100,000 are said to have been sold in English, or in translations. He afterwards wrote “Two letters to sir Jacob Banks, concerning the Minehead doctrine,” 1711, 8vo. Nichols’s Life of Bowyer. Chalmers’ Life of Ruddiman, p. 176. 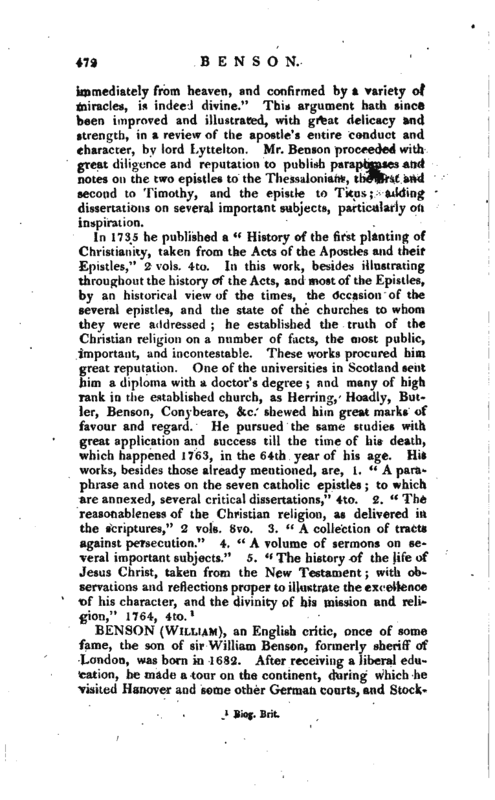 Pope’s Works, vol. V.